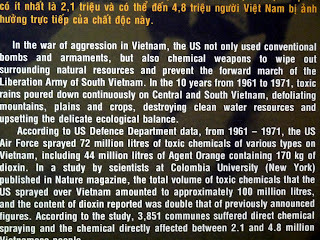 Thankfully, we arrived in Saigon around 1 am. The airport was very quiet and the whole city seemed asleep. This was a good thing. If we had arrived during the morning rush, we probably would have hopped back on the plane. Saigon or Ho Chi Minh City, as the newer generation calls it, is a certifiable mad house. I have never seen such a densely populated action packed city. It didn't help that there were motorcycles going every which way and we couldn't walk two feet without someone asking us if we wanted a ride on one of them. Crossing the street was a major ordeal because most of the time, there wasn't a light to guide us. And if there was a light, it was usually ignored. We quickly found out that there was a technique to get to the other side. Step one: Pray to God, Buddha or Vishnu, whichever you prefer. Step two: Wait till all the cars have passed. Cars have less maneuverability and hurt a lot more when they run into you. Step three: Walk with a steady deliberate walk. Even if a motorcycle is coming straight for you, it is important not to stop, back-up, cry or run to the other side. Step four: Hold your breath. As you walk, the motorcycles should steer around you. Hopefully none of the riders fought in the Vietnam war and hate Americans. Step five: Thank God, Buddha or Vishnu once you have safely reached the other side. Standing and waiting for a break in the traffic is a sign of a real amateur. This pause never actually happens so you could be waiting for a very long time or at least until a seasoned pro or a friendly local comes along and helps you. 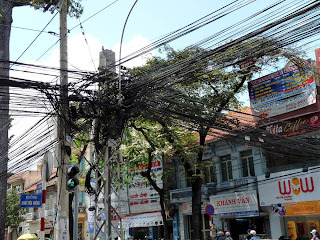 If there is one picture that sums up the chaos that is Saigon, it is the one below. This was a typical mess of the power lines. I guess none of the cables are below the ground (for unknown reasons) so they were all quite exposed. 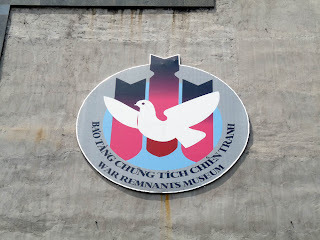 Our first stop was the War Remnants Museum. This was previously known as the Museum of American War Crimes but that was probably a little too blunt for a lot of tourists and they had to tone it down a little. After all, those tourist dollars are pretty sweet. 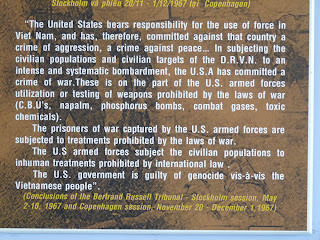 The first sign that we encountered makes it seem like the museum is dedicated to world peace. Actually, that is incorrect. 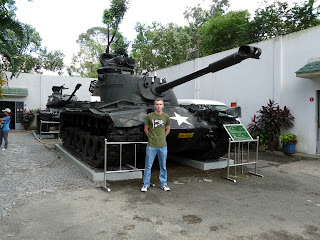 The museum is dedicated to saying, "F%$k you, Americans!" 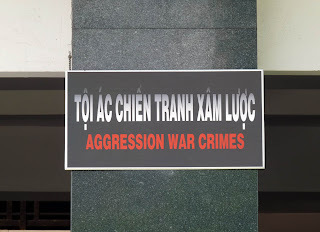 Aggression War Crimes? Gee, I wonder who they are talking about? This was the sign above the first doorway. Just a warmup for what we were to encounter after entering. 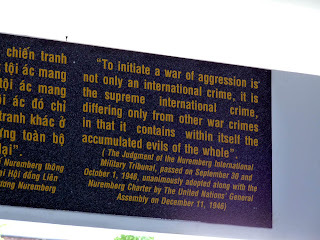 These plaques were meant to clarify the museum's position on the Vietnam war as if there were any doubt. I thought this plaque was very interesting. 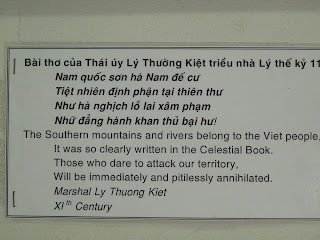 It was the Vietnamese way of saying "If you f&^# with us, you'll get f%$ed!" The Americans obviously didn't know about that damn Celestial book! 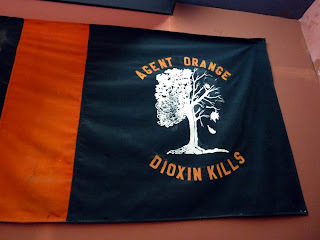 There was a very large section dedicated to the effects of Agent Orange. They did not shy away from showing extremely grotesque pictures of the mutations caused by this chemical defoliant. It was like looking at the family album from The Hills Have Eyes clan. I'm a doctor and I found many of these pictures extremely disturbing. As if all the pics of disfigured kids weren't enough, they had to include some very graphic photos of the war victims. 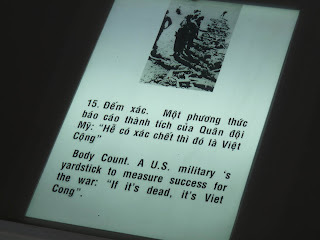 Of course, all the photos were depicting the horrible way the Americans treated the Vietnamese. 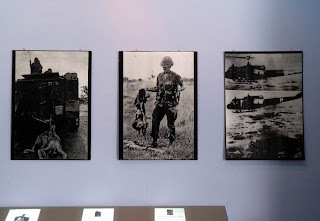 In this lovely little tableau, we have photos of dead Viet Cong being dragged behind an American truck, an American picking up the remains of a clearly dead Viet Cong and a Viet Cong being dropped from an American helicopter. Okay, okay, we get the point. Americans are evil! 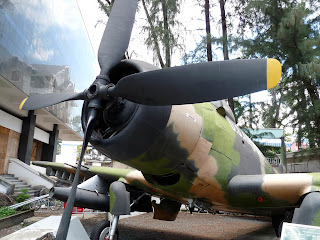 Out in the court yard, there were various planes and tanks. I thought this was where I could get a little peace from all the graphic brutality inside but I was wrong. A war victim came up to me and wanted to sell me some guide books. He didn't have much for arms and he offered up a stump for me to shake it. Normally I would not have been grossed out by such a greeting but after walking through the museum, I was not in the mood for such real life consequences. Trying not to be rude, I shook his stump briefly. It was soft and round and felt a little doughy. I thanked him but I told him that I had enough guidebooks. He left to find other beleaguered tourists to harass. With all these images of death and destruction, I still couldn't resist a good photo op. Yep, call me the eternal tourist.